Cameron’s musical and linguistic careers recently led him to stand in solidarity with the people of Iraq by sharing Iraqi love songs on the streets of Baghdad in 2003. 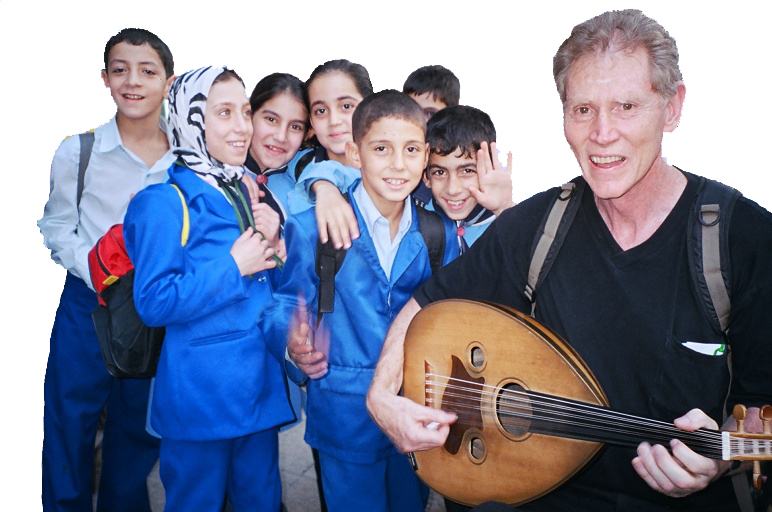 His lifelong musical adventures with Latin American and Middle Eastern peoples have culminated in a series of recent concerts and multi-media presentations designed to promote peace. High points of these adventures included performing in the Cairo stadium before an audience of 60,000 Egyptians to help raise funds for a new Children’s Cancer Hospital. Now back from multiple trips to Egypt, Jordan, Syria, Lebanon, Iraq and Palestine, he and his partner, Kristina, have been busy traveling in the US and helping people better understand the Middle Eastern, Arabic, psyche. Well over 200 musical and multi-media presentations have recently been completed in more than half of the American states. Funding to help support refugee Iraqi musicians preserve Iraqi musical culture by passing it on to Iraqi children has passed through the non-profit organization, Musical Missions of Peace, now known as Musical Ambassadors of Peace, which was designed and built around Cameron and Kristina’s work.